I really enjoy Christopher Schwarz’s Lost Art Press and the books which just keep coming from there. 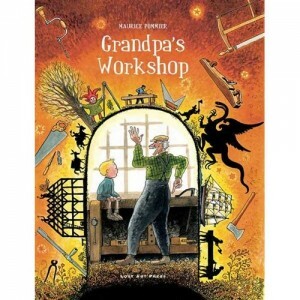 One of the latest is “Grandpa’s Workshop” by Maurice Pommier. This book is pure magic. It looks just like a children’s bedtime story book with wonderful line drawings, dragons, sailing ships, geese chasing little boys in their dreams, old stage coaches, steam trains and steampunk, silhouettes, beautiful colors, Grandpas, Grandsons, tools, old tools, tools that you know about and wish you had, tools that your Grandpa had in his shop and never let you touch because your Mama would be mad if you got hurt using them, dusty chests full of old tools at the back of the shop, elves behind the wood stacks and mice. I’ve got some old dusty tools in the back of my shop, and maybe some mice. And there could be some elves back there too. 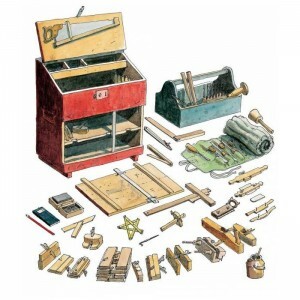 If you love wood working and old tools; if you have kids or grandkids you want to introduce to our hobby; If you just love beautiful books — this book is for you. Get it for Christmas. In fact, get one for you and one for the kid and one for the Grandkid. I love this book!